The shooting continued for at least a minute and a half, though some eyewitnesses claimed it may have been three minutes or more. Perhaps as many as 150 shots were fired. The magazines in several of the sixteen-cartridge Winchesters were fully discharged. Blood, smoke, road dust, and cries of anguish overwhelmed the scene. Nineteen marchers lay dead. Another thirty-six were wounded. The force of the steel bullets literally tore many of the bodies to pieces. Even those who had taken bullets in their limbs were critically wounded. A few of the deputies walked among the dead and dying, kicking them, while others helped those who were wounded. When the shooting stopped Sheriff Martin uttered, "I am not well." On Friday, September 10, about 300 to 400 unarmed strikers—nearly all of them Slavs—marched to a coal mine owned by Calvin Pardee at the town of Lattimer to support a newly-formed UMW union. Their goal was to support the newly-formed UMW union at the still-open Lattimer mine. The demonstrators were confronted by law enforcement officials several times on the road and ordered to disperse, but kept marching. When the demonstrators reached Lattimer at 3:45 PM, they were met again by the sheriff and 150 armed deputies. Sheriff Martin ordered the marchers to disperse, and then attempted to grab an American flag out of the hands of the lead marcher. A scuffle ensued, and the police opened fire on the unarmed crowd. Nineteen miners died, and anywhere from 17 to 49 others wounded. All had been shot in the back, and several had multiple gunshot wounds which indicated that they had been targeted by the deputies. Immigrant mine workers increasingly resented their second-class status. In the summer of 1897, the conflict came to the Hazleton area. A wave of strikes, organized by foreign-born workers, rippled through area mines. 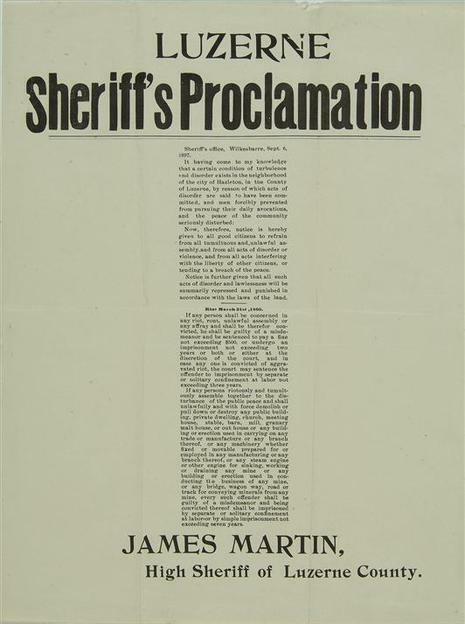 The coal companies prepared to break the strikes by force and provided weapons for Sheriff James Martin's newly deputized 150-man posse. In September, as the strike was about to spread to the tiny patch town Lattimer, striking miners at Harwood prepared to march to the neighboring community to demonstrate their solidarity. They paraded with an American flag flying proudly at the head of their lines. At Lattimer, Sheriff Martin's forces met them, issued an order to disperse, and then opened fire upon the unarmed men. 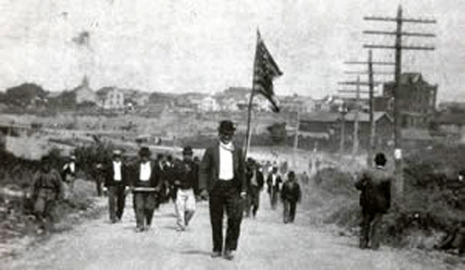 On September 10, the strikers marched to Lattimer and were stopped by a force led by Sheriff Martin. The unexpected halt led to confusion and jostling, and shots suddenly rang out. Nineteen of the miners were killed, and perhaps fifty more were wounded, in what became known as the Lattimer Massacre. Although the violence was committed by the so-called forces of law and was needless, the sheriff had dispersed larger, rowdier crowds alone in previous confrontations. No one was convicted for the murders at Lattimer.